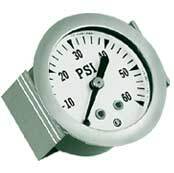 Standard dials are PSI only. PSI/Kg, PSI/kPa and PSI/Bar also available. Oxygen cleaning, other scales and special configurations available on request. For more information, contact us at 800/323-5111.